We have been blessed with some gorgeous weather lately, and Summer has definitely arrived! This weekend it’s been all about the garden for us. On Saturday I went to Gardener’s World Live, which was fab and full of garden inspiration and yesterday we spent the entire day outside. This week’s guest post is all about enjoying your garden and making the most of it. 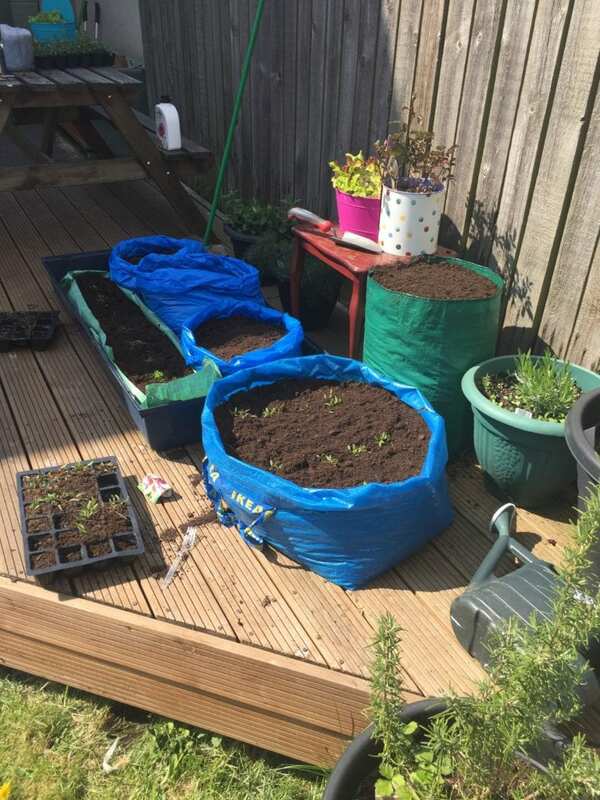 This week’s guest post is written by Helen who blogs over at The Mumatron Blog, and today she is sharing with us some of the ways that she enjoys her garden with her little boy. Hi I’m Helen, aka The Mumatron. Mum of one and amateur garden enthusiast. I live in the beautiful county of Yorkshire and love to get outdoors as much as I can. 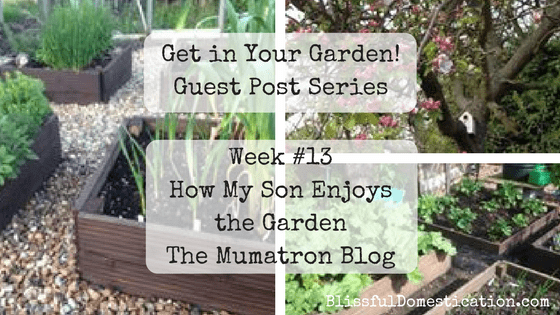 My blog, The Mumatron Blog is all about our adventures both in and out of the garden. My go to place to spend time with the family when it’s dry is our garden. I think green fingers runs the in family, if such a trait can. My Nan (who lives next door) can take a bit of a twig, stick it in the ground and a couple of years later she’s got a plant worthy of Chelsea Flower Show. I prefer to treat my garden as an extension of our home rather than a space in it’s own right. Luckily my love of the garden has been engrained in my son. 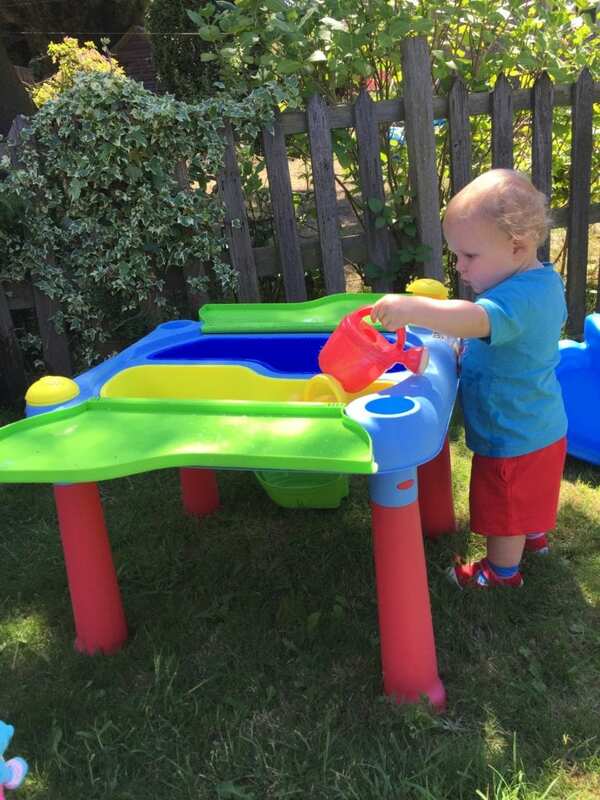 Here are some of the things he loves to get up to in the garden. This year we have gone for a rather basic mix of root vegetables and salad. Carrots, beetroot, potatoes and herbs are all present and coming on very well. What’s is that Hugo knows that these are plants that he can eat. He’ll often help himself to a bit of lettuce or mint. He knows that there is something different about these plants and I hope that means that when they are ready he’ll want to eat them. It really is a fab way to get little ones engaged in the garden, and their veggies! It might sound cliche, little boy, worms and all but it’s true. If there’s a worm in sight it needs to beware (I need them for our soil!) curious little fingers will have him whipped up and moved on in no time. We have lots of bees, which is also great for pollinating the veg. Hugo loves watching them buzz around the plants. As soon as the watering can is in sight it requires filling so that Hugo can go about his watering. He took to this very quickly after watching me once or twice. He had a watering can in the bath for a while so it stands to reason that he knows what to do, I just love how he gets that it’s the plants that need the water (ok well sometimes shoes, mummy’s shoes or Nana’s ceramic garden ornaments!). There’s something very relaxing about eating outside. I find meal times far less stressful. Perhaps it’s because no amount of mess seems overwhelming when we’re outdoors. Then the birds come along and scoop up what’s left. Everyone’s a winner. I am weary of Hugo drinking whatever he finds outside. 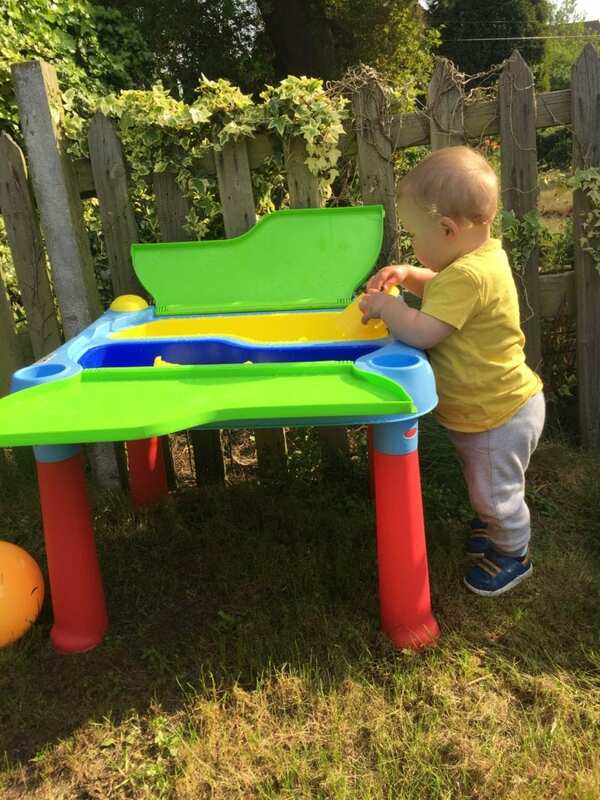 He’s taken to drinking from the water/ sand table and if I’m honest it’s just an insects graveyard. I can give him his cup and he’ll drop it in favour of the rancid play water. Hugo loves feeding our rabbit, Warren. He knows that he can pull up some of the dandelion leave and go push them through the cage. Weeds gone, Warren fed, everyone’s a winner. Obviously rabbits can’t eat everything that Hugo would want to feed him – Goodie carrot stix aren’t his favourite it has to be said. There are so many wonderful things for children in the garden. I find that if I sit and watch from a safe distance he’s so happy to just explore and share his findings with me. We have toys, mainly ones that have been passed down or given to us and I’ll be honest, he’s not even that bothered for them. He’d much rather do his own thing. Thank you so much Helen. 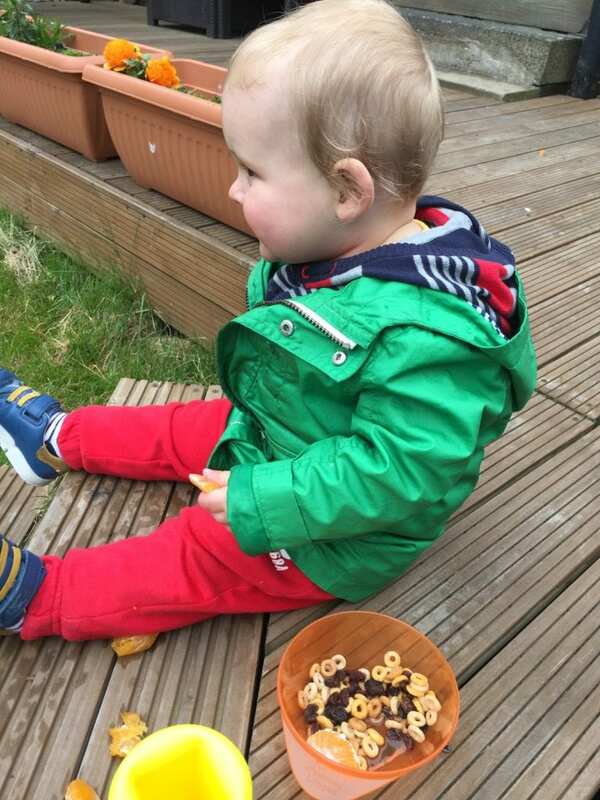 It’s lovely to see your little one enjoying and making the most of your garden. If you have enjoyed reading this then why not head over to Helen’s blog The Mumatron Blog, or you can also find her on Twitter, and Facebook. If you are enjoying the Get in Your Garden! guest post series then fill in you e-mail below and I let you know when a new post is published, and no spam I promise!